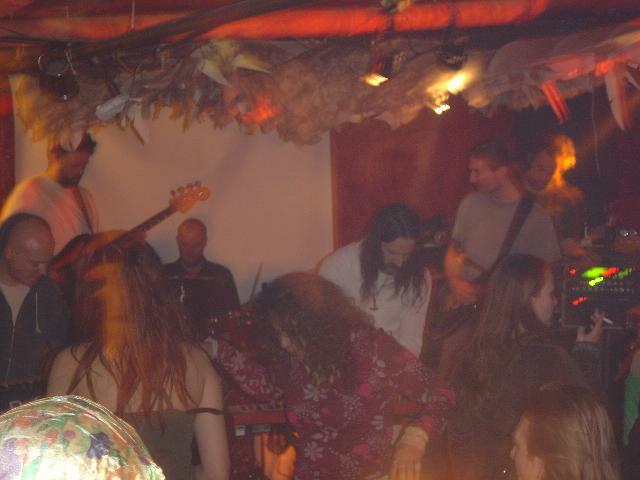 This was the debut gig of the Øresund Space Collective but it would be a long time before we would get to play. The first band, Dream Jockey, were to start at 10 but managed to not get started until 10:25, waiting for 5 more people or something to show up. They played a sort of clean poppy-dreamy music mixed with a distorted Sonic Youth type approach at times. The drummer was wild, a bit like Keith Moon! Pretty cool band. Next up was Tender Prey. I know the singer Victor but had never seen him perform before. I had heard that his band played pop music, and they do but it is a bit strange and interesting at times. It is a genre of music I don't know well but they seemed quite good at what they did. A lot of people were in the house now. They did not finished until 12:30 and then we had to set up all our gear. Everyone was in good spirits even though some of the members were not feeling very well. The crowd was clearly mostly here to see us (I think some thought they were going to see Mantric Muse!). It was a very late night. We did not get to start playing before 1:30 in the morning and we played until nearly 5! We took a couple of small breaks but pretty much kept the space music flowing and the people still wanted more at 5 in the morning. The response was amazing from the people. The line up of two guitars, two bassists, drums, conga-djembe, percussion, two synthesizers, worked amazingly well. All of the stuff was recorded and sounds quite good. We really were on a great journey this night and played stuff like we have not played since some of the early jam sessions. The music is broken down into 13 pieces. I think it was a very successful first gig and people were really into it enough that 30 people were still there asking for more at 5 in the morning!!!!!!! !